Our original Ben Cromer Adventure Center was established in 1993 in one of our former outdoor classrooms. It was destroyed by an early morning fire in April of 2002. A new and much larger Adventure Center was built near our bouldering wall in 2003. 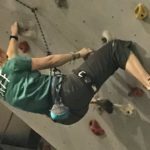 The elements and program are geared toward planned success to build inner confidence, trust, and team building through shared struggle, communication and accomplishment. The initiatives are physically engaging, intellectually challenging, spiritually stimulating, and tailored to the abilities of participants. Physical ability is far less important than tenacity in the cooperative search for solutions and the ability to think creatively. There are three areas in the new adventure center. There is a front welcome center area, a middle bouldering area, and a taller back room for top roped climbing and rappelling.